We are really blessed with some fabulous steakhouses in Abu Dhabi. 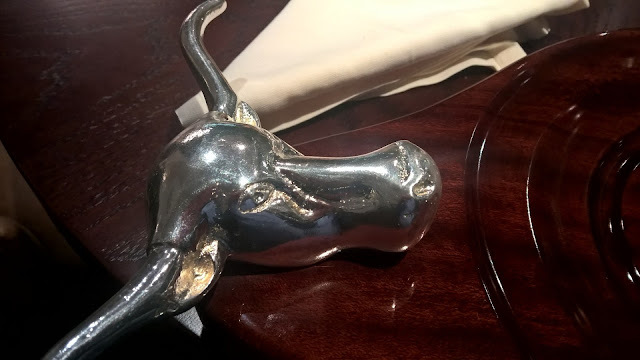 It is a highly competitive sector in Food and Beverage - if you doubt that, just wait when the award season comes around and watch the reaction from staff when a restaurant wins the best steakhouse award. 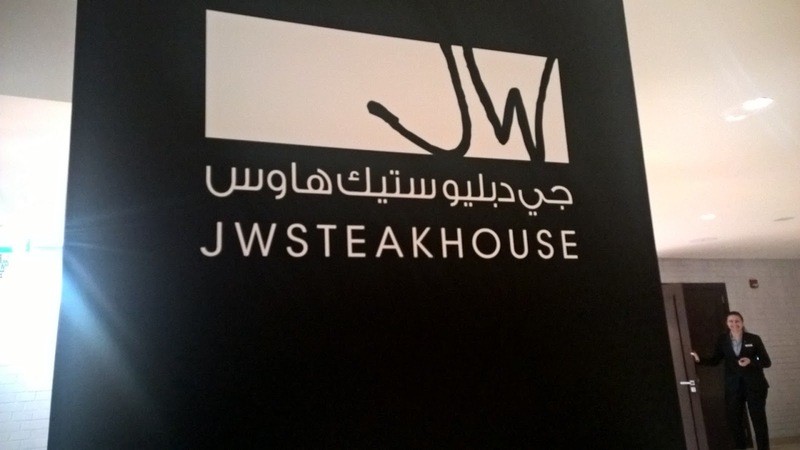 Needless to say, when the new Marriott Downtown Abu Dhabi launched its JW Steakhouse, I was at the front of the line to try it and see how it stacks up against its competitors and to see what its x-factor is. 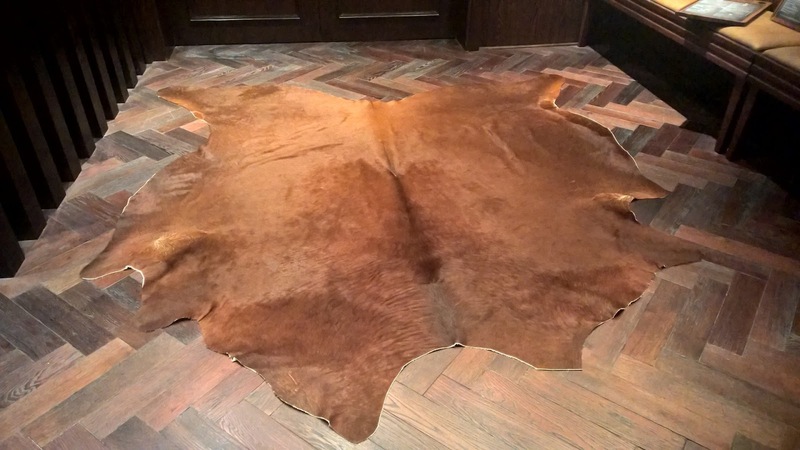 Cow hide rugs adorn the bar as I make my way to the JW Steakhouse. White leather seats add a feminine touch to what is traditionally a very male concept. Masculine steakhouses are more the norm than the exception. The cow hide theme continues as I enter the steakhouse. This time, there is one at the entrance. The first point that makes an impression on me is the intimacy; the restaurant accommodates around 50 people, highlighting the cosiness of the restaurant. If there was a hint of a more feminine touch to the steakhouse, it is gone as masculinity comes to the fore. For those who enjoy city lights, window seats will keep you firmly connected to the city. 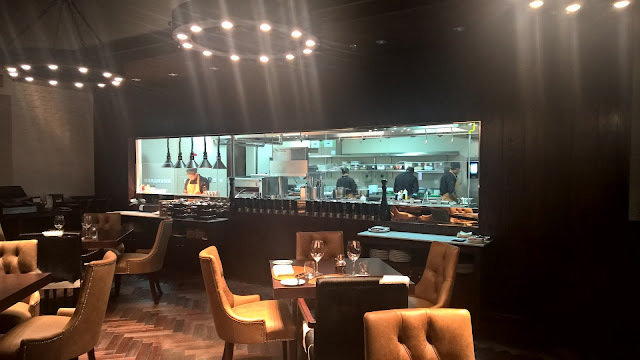 Finally, an open kitchen hints at an early x-factor, a there are only a handful of steakhouses that afford guests the chance to enjoy some theatre as their dishes are prepared. Trolleys are one of the extra value 'gimmicks' that steakhouses offer guests. They allow for natural interaction between staff and the guest. JW Steakhouse has opted to go with a Bourbon-meets-mixology trolley; something different. It makes sense - an American steakhouse of course. 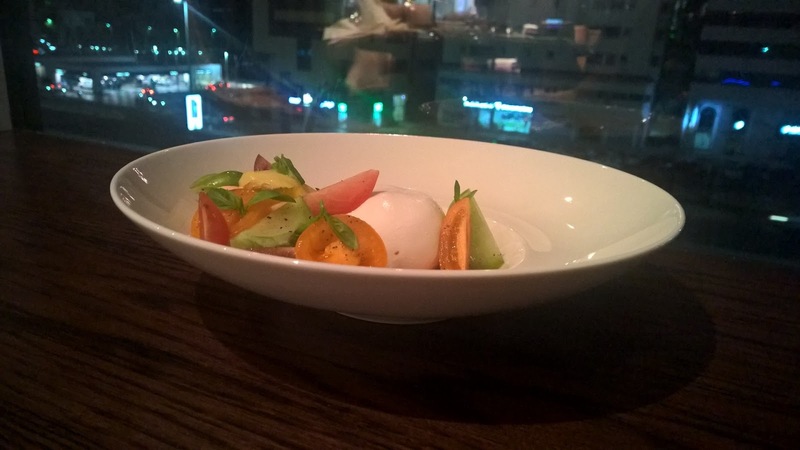 To get started, I choose the Heirloom Tomato and Burrata, a staple at steakhouses. I appreciate the respect that Chef and his team show this dish. There is a lot of restraint illustrated as I end up with a dish that is simply seasoned in which heirloom tomatoes really shine. Oh, did I mention the surprise in this dish? Heirloom tomato sorbet. This ensures that this dish is really about the tomatoes reducing the usually prominent burrata to an almost incidental ingredient. Something different. Something creative. Something contemporary. 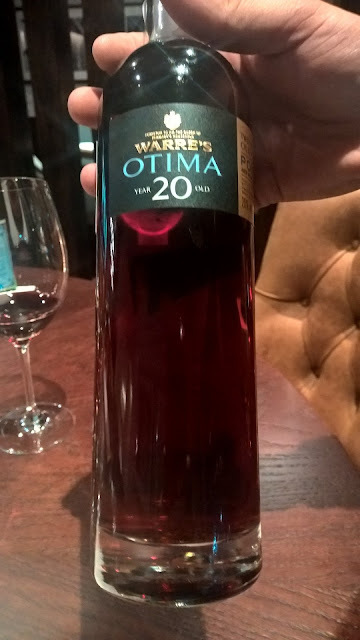 Highly recommended, and at 65AED, a great price! I follow this up with the Beef Tartar. It is made from USDA Prime tenderloin. There is something very homely about the way it is presented. Simple, privileging the end result. No tabasco sauce, allowing for a change from the typical beef tartar offerings at a couple steakhouses. 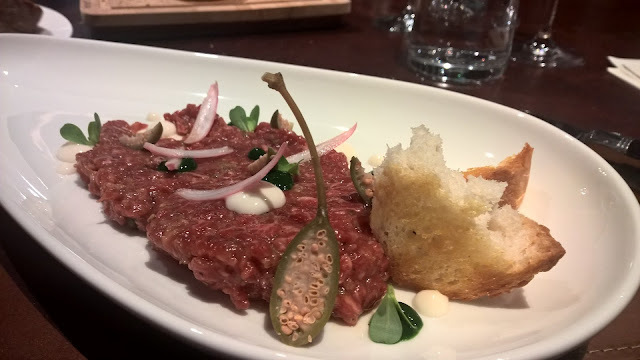 Capers, shallots and sourdough ensure though that there is enough flavour in the beef tartar. But there is more, and here is what makes this dish memorable - watercress gel. Something different. Something creative. Something contemporary. On the wine side, there are 17 by-the-glass choices, including 3 sparkling. 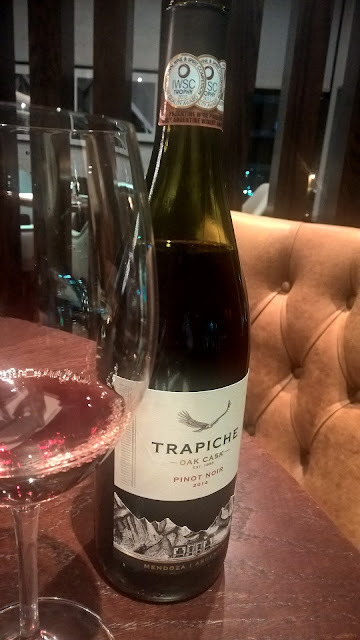 These options are very well priced, ranging from 30-85AED for a glass of red. The Frontera Cabernet Sauvignon from Chile is a decent and affordable entry level glass of wine. I leave the wine pairing to restaurant assistant manager Sukhil who is very at home making recommendations. He is comfortable talking about the wines, and I immediately feel he fills the void that would otherwise be felt in the absence of a sommelier. All through the night, his suggested pairings would prove to be spot on. Chef de cuisine Stephan Benkendorff has assembled a fine team of chefs in the kitchen who certainly have put meaning behind the word 'contemporary'. Their subtle variations on certain dishes show a deft balance between respecting tradition and innovation. For my main course, there is no doubt what I will have. 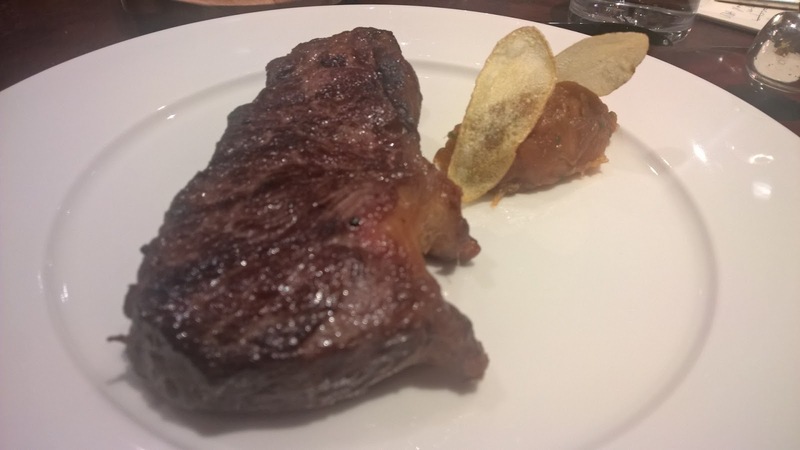 While we have around 5 top steakhouses in the city, there is something predictable in most with the type of beef that is on the menu. The latter, by the way, is very succinct, in keeping with the trend at other steakhouses around the city. I find that something different in the Kettyle Northern Irish Grassfed Aberdeen Angus. I am very excited about this beef, grown on the grasslands and islands of Lough Erne. 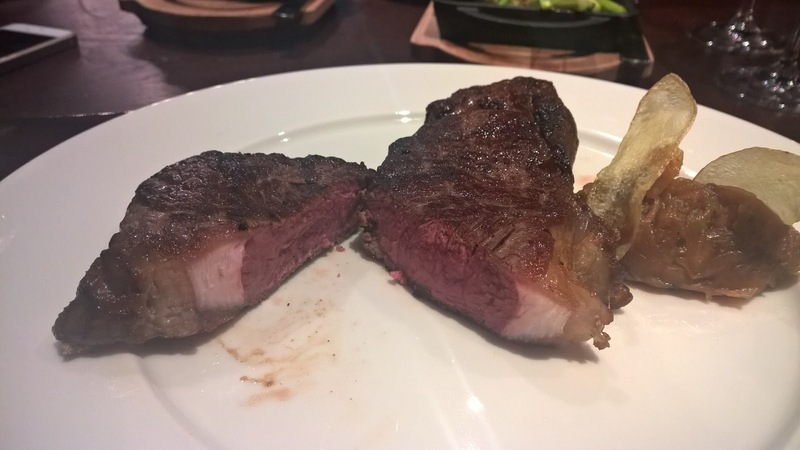 The usual USDA and Australian wagyu cuts are also available, including a flagship Master Kobe cut, but this is by far the most alluring on the menu. Incidentally, there is no tomahawk on the menu, but they do offer an Australian Wagyu Tenderloin for 2. In anticipation of my choice, I am offered a Laguiole steak knife - a given in a steakhouse these days. My striploin, meanwhile, comes in at 210AED for 300g - great value for money if you consider what competitors, with one or two exceptions, are offering. A choice of 9 sauces is offered to me, but as you know by now, I never have sauce with premium beef - let the beef speak for itself. In the end, it does speak. It has that typical striploin firmness but with a lot of butteriness. 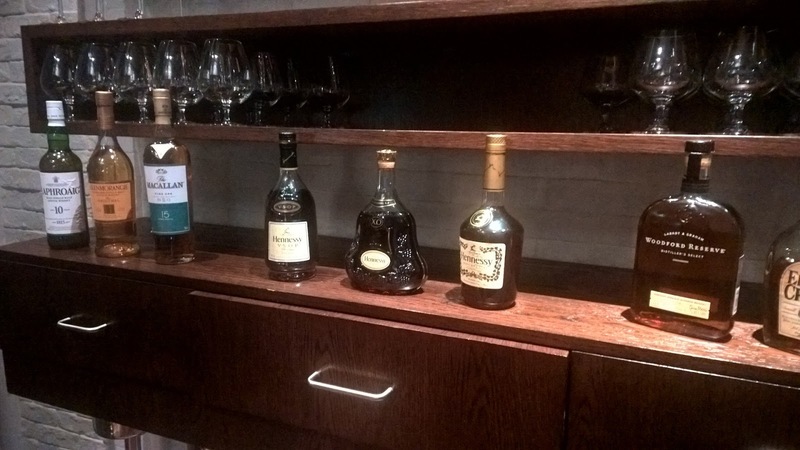 A welcome addition to steak choices in Abu Dhabi. Furthermore, generously portioned sides bring that 'value for money' tag. The asparagus is beautifully done. Large chunky cuts of asparagus seasoned with butter and covered in bread crumbs make this simple dish a nice option as a side dish. The same applies to the French fries. I have to say these are probably of the best fries I have had at a steakhouse. 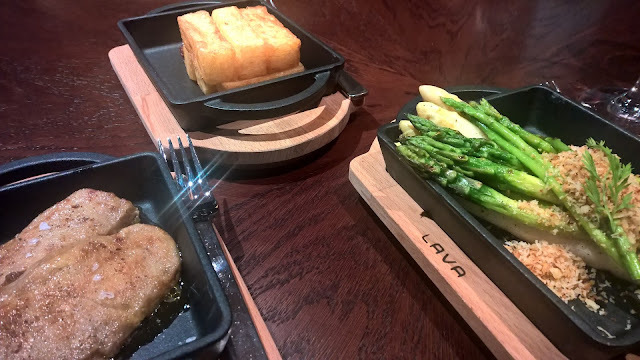 However, my requested topping of foie gras lacks a bit of imagination, as all that is placed in front of me are two seared foie gras steaks; I just feel overwhelmed by two large foie gras steaks staring at me. Granted, it is served a topping and not a dish, but maybe a bit more could be done in terms of presentation? For dessert, it has to be the New York Cheesecake. There are those items on a steakhouse menu that one dares not try to be too creative about, and this is one of those. 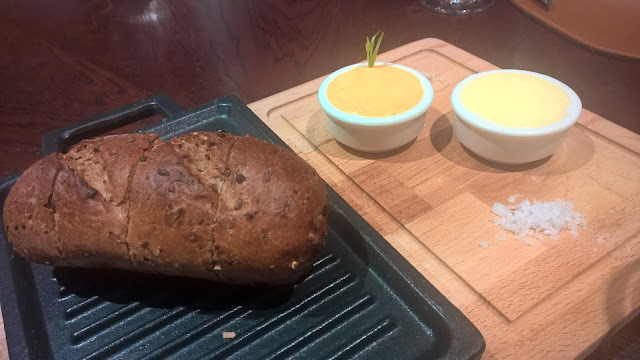 With its firmer texture than the cheese cakes more commonly found in the city, this is a winner. 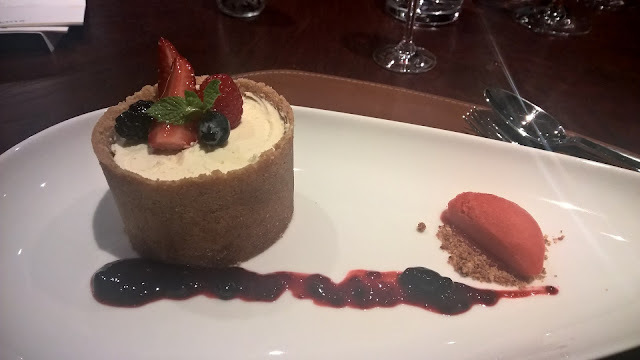 It is ensconced in a biscuit crust, adding bite to the cheesecake, while berry compote adds an element of sourness. This cheesecake, based on the recipe from Grosvenor House in London, is an absolute must have. 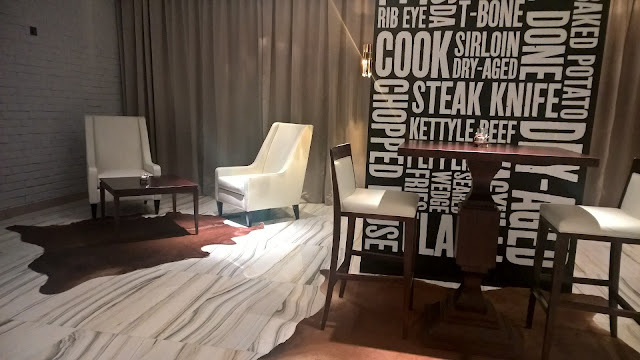 JW Steakhouse brings to Abu Dhabi a solid offering with some quintessential steakhouse elements, with some nice touches that will endear diners. Well trained staff under excellent guidance from Peppiina Pentti, a restaurant manager who brings a pursuit of perfection to her staff and an assistant manager who ensures that guests will have the right pairing with their dishes, a succinct menu in line with competition and a very exciting Northern Irish offering. On the other hand, as a restaurant offering a 'contemporary take on a classic American steakhouse', I want to see more pizzaz, for want of a better word - it is the x-factor I mentioned in my opening remarks. It does everything solidly, but I need a stronger identity especially if you look at the competition. However, I can see it evolving, though, as do most restaurants when they have just opened. 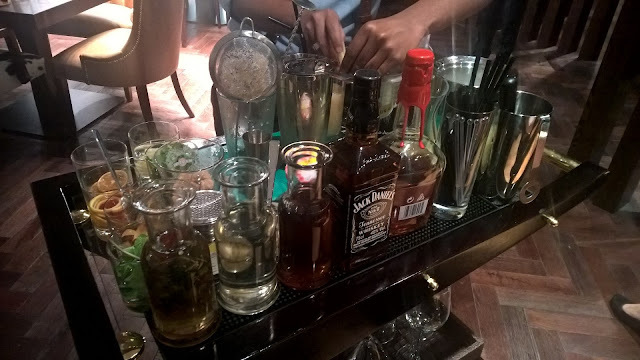 Nonetheless, it makes for a super evening out, conveniently located in the heart of the city. It will ultimately win over diners with its promise of an all round good steakhouse experience.